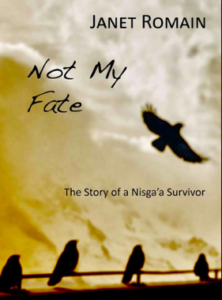 “Not my Fate’ the Story of a Nisga’a Survivor is the name of my newest book. 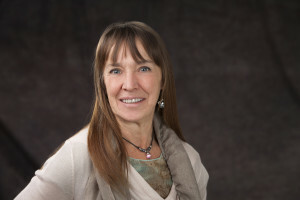 It was published by Caitlin Press in the fall of 2016. This book was not easy to write. As I worked on it I came to look at Canada with eyes that saw more than they did before. It was a long process to get this book from draft form to publication, with many rewrites, some laughter and some tears. Most of the names have been changed in the book to protect people’s private lives. A friend has pointed out that people are defined by opinion in the book and that someone else’s opinion of a person does not define that person. I totally agree. Other people may see a completely different aspect. That is another good reason for fictional names. In the book I tell the story of my friend who I call Jo. I admire her strength and her happiness. She continually chooses the high road and has determined her own fate. While writing this book I discovered many things about North America and colonization. Some of it is uncomfortable. I did write some fictional parts into the book to describe Jo’s mother and grandmother. Their true stories are lost to Jo and time. I am very happy with the final version of the book and would like to thank Caitlin Press and their wonderful team for their support. 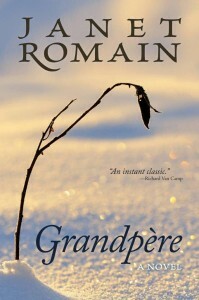 Grandpère is a story that came flying out of my fingertips onto the computer. 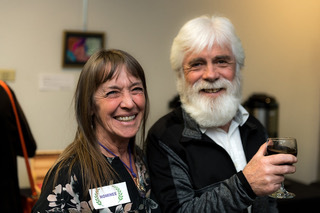 It began with the idea of a brush pile cremation, which is a traditional method of body disposal in many parts of the world, including the area where my roots are sunk. I didn’t do any of the things considered proper when I wrote Grandpère; there was no story outline, no prep work done whatsoever. The story seemed to tell itself, taking its own little twists and turns and delighting me in the process; it took only three months from start to finish of the first rough draft. I was mighty pleased with the story and I gave it to my sister to read, whose judgment I trust, she’s honest even if she’s not really arms length. She pointed out a few of the books flaws, which I quickly tried to correct, but on the whole was very positive with her feedback. So there I was, story written- with not a clue of how to market it. So I did what any sensible modern woman would do-I googled ‘how to get published’. I opened up realms of new information and spent days reading page after page, letting the net lead me around into all the areas of book production. General consensus was to get an agent, let the agent do the selling, the agents are like realtors, they know the rules and can protect their clients. To that end I signed a contract with Carolyn Swayze Literary Agency and she sold Grandpère to Caitlin Press. Then the work really began, the fine tuning of the story, what to leave in, what to take out. The team that Vici, of Caitlin Press, assembled was great to work with and I am so pleased with the result.